The town hopes to reverse a trend of declining school enrollment by building moderately priced housing for all ages. 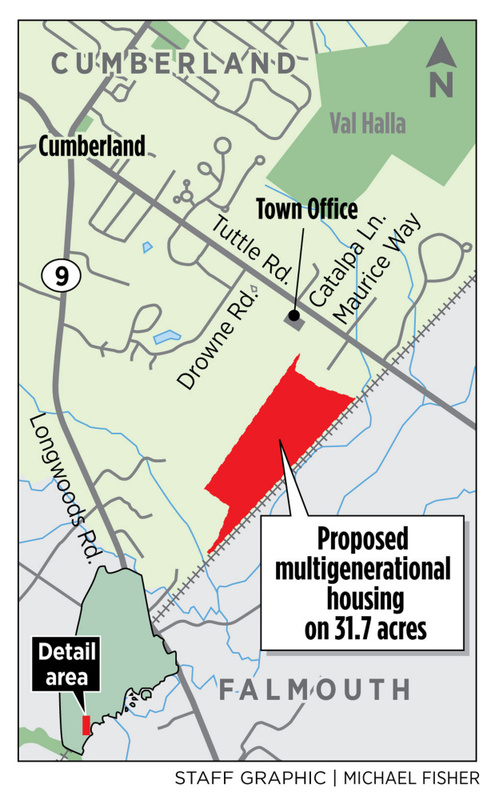 Faced with declining school enrollment, the town of Cumberland wants to partner with a real estate developer to build an entire neighborhood that would include housing for people of all ages and income levels. Cumberland officials recently issued a request for qualifications, a means of gauging developer interest in the proposed project. The neighborhood would be developed on 31.7 acres of town-owned land southwest of Tuttle Road near Cumberland Town Hall. The project stems from a study completed in January that predicts a continued decline in student enrollment over the next decade in the Cumberland-North Yarmouth school district, also known as SAD 51, unless more diverse housing options are created in the community. The study was conducted by consulting economist Charles Lawton. In a typical community, families with children tend to occupy larger homes. When the children reach adulthood and move out on their own, the parents tend to downsize to a smaller home, another growing family moves into the larger home, and the cycle continues. That’s not really happening in Cumberland, according to Town Manager William Shane. Instead, residents are remaining in their homes as they age, and as a result the student population has been decreasing. Historically, about 50 percent of the homes in Cumberland have had children enrolled in the school district, he said. But over the past 25 years, that figure has fallen to about 25 percent. Meanwhile, Cumberland-based enrollment in SAD 51 has fallen from about 2,400 students to roughly 2,000 students. Declining enrollment typically leads to a loss of revenue for public schools and can result in schools being shut down. One reason for Cumberland’s decline in school enrollment is the relatively high cost of homes in the area, Shane said. The median home price in Cumberland is $350,000, he said, compared with $295,000 in Cumberland County and $206,000 statewide as of July. Most young families can’t afford to move into a $350,000 home. Shane said another factor contributing to the decline is the lack of a diverse range of dwelling sizes and types. Even if an older couple in Cumberland wanted to sell their three- or four-bedroom house and move into a smaller house, townhome or apartment, they wouldn’t have many options without leaving the community. The “Tuttle Road Moderate Income, Multi-Generational Neighborhood Public-Private Partnership Initiative” is an attempt to change that, Shane said. Lawton, the economist who conducted the school enrollment study and a columnist for the Press Herald, said the project as described could help bring the town’s student enrollment back up to the historical levels that area schools were built to accommodate. “We can’t achieve that if we’ve got all these people, in a sense, hogging all the family-friendly housing,” he said. The request for qualifications describes the Cumberland project as “a compact and multi-generational neighborhood environment” that would be appealing and affordable to a wide range of households, from families with school-aged children to seniors seeking either independent living or assisted care. “To achieve these objectives, the town is seeking a developer with the experience, technical capacity, financial capacity, initiative and creativity to work collaboratively with the town on designing, permitting and implementing such a neighborhood,” it says. As described in the request for proposals, the project’s goal would be to build 75 to 100 dwellings with a mix of one-, two- and three-bedroom units. It would include a mix of housing including single-family homes, duplexes, townhouses and apartments. The project would include dedicated space for a senior assisted living facility with at least 50 beds. The neighborhood would be “compact, walkable and interconnected,” with easy access to a multigenerational recreation facility, green space, parks and other shared amenities. The homes would need to be affordable to moderate-income households with incomes ranging between 80 percent and 100 percent of the Portland area’s median family income of $83,400 a year, according to the request for qualifications. All of the dwellings would be rentals and would not be available for purchase. Shane said the town has conducted surveys of residents and found many would like to see more options for rental housing in the community. To entice developers, the town is considering a number of options, including “removing or limiting the land costs for the developer,” subsidizing the cost of infrastructure such as roads and utilities, and creating a tax increment financing district around the neighborhood, which would reimburse some of the developer’s property taxes over a period of years. Shane noted that the project details have not been finalized, and that they could be altered based on input from residents. The project might not happen at all if enough residents oppose it, he said. Cumberland officials plan to conduct public meetings in October to present details of the project and receive input from the community. “From that, the (town) council will have to make a decision,” Shane said. The request for proposals indicates that changes would need to be made to the property’s zoning to allow the project to move forward. However, it notes that the concept of a multigenerational neighborhood is consistent with the town’s comprehensive plan. Cumberland is hosting a pre-proposal conference for developers at 9 a.m. on Thursday at Cumberland Town Hall, 290 Tuttle Road. Developers interested in the project are required to submit their qualifications by 5 p.m. on Sept. 27.